· Imperial - Made in Imperial black to match its villain, Darth Vader, the Imperial SMS Audio headphones have a high-shine finish with black leather cushions and red stitching. 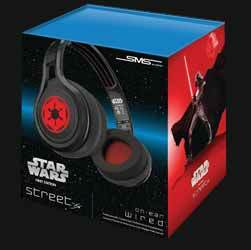 Also in black, the ear caps show off the emblem of the Galactic Empire in red. · Stormtrooper - Echoing the Stormtroopers’ high-gloss white apparel, each pair sports the iconic Stormtrooper helmet on its ear-piece emblem. The black, plush leather ear cushions and padded headband have white stitching and provide stylish comfort. 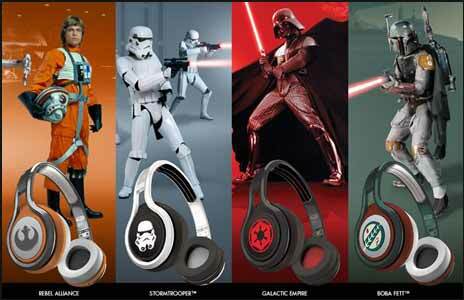 · Rebel Alliance - Join Luke Skywalker in the fight to restore the ‘Old Republic’ with these orange and metal-grey headphones. Similar to Skywalker’s memorable orange flight suit and marked with the Rebel Alliance’s “Starbird” symbol, the Rebel Alliance-branded headsets feature a grey headband, orange ear caps and white leather ear cushions. · Boba Fett - Emulating Fett’s subdued colour palette found in his armour, the Boba Fett headphones are a deep forest green complete with rust-red ear caps and ivory leather ear cushions. Each pair sports the bounty hunter’s chest symbol and Mandalorian insignia. Which pair you opt for depends very much on your own personal tastes. For review we asked for an Imperial set, mainly because they looked the coolest (red on black) and offers the most subtle design which means you won't stand out if you're around non Star Wars fans. The presentation for these headphones is impressive. They come in a sturdy cardboard box which has a protective sleeve around it. As a testament to how strong this was, when we received it (through Royal Mail) there was no other packaging - just the thin bubble wrap envelope it was housed in. There wasn't a mark or dent anywhere on the box. Once you remove the sleeve, the box has another wrap around segment which is held shut with the aid of magnets. Once you've opened that there's a lid which can be opened and this is where everything is safely hidden away. 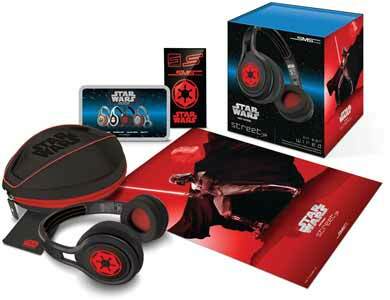 Along with the headphones you get a Star Wars logo embossed hard carry case (so you can protect your headphones and easily transport them in your bag); removable cable with 3-click mic (this allows you to repeat a track, skip a track and answer phone calls - depending on what you're plugged into); Star Wars soft cloth; First Edition Star Wars poster (12" x 18"); a sheet of Star Wars stickers; Owners manual; and Certificate of authenticity. They come equipped with professionally tuned 40mm drivers that deliver genuine studio mastered sound and Quiescent Passive noise cancellation that seals off the outside world. If you're looking for a good, solid pair of headphones that not only sound great but also look cool, then you should take a look at this range.